ESCONDIDO — Growing by the foot, Reidy Creek Golf Course is adding a new twist to its experience. Footgolf, a budding new sport, is taking precedence alongside traditional golfers at the course. On Saturday, the official grand opening was held with Mayor Sam Abed, Deputy Mayor Mike Morasco and Councilman Ed Gallo in attendance for the ribbon cutting. Despite some sketchy weather, Reidy Creek golf pro Erik Agnew said between 30 to 40 people attended the opening, while more rolled in once the skies cleared. 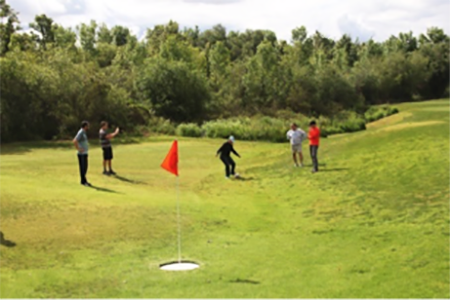 The niche sport is becoming more popular in San Diego County and with the slumping golf industry, it made sense for the city-owned course to add footgolf, Agnew said. As for the rules, it’s pretty much the same as the traditional sport. Golfers tee off, kick the length of the hole, albeit the yardage is much shorter, and putt into 21-inch wide cups. The course, meanwhile, is adjusted for footgolf as the holes are moved off the traditional greens. Since the back nine of Reidy Creek has its topographical challenges, Agnew said the footgolf course is relegated to the front nine. He said the move to footgolf made sense because of the county and city’s large soccer population. Agnew said several soccer teams have come to play the course. H’s also been hard at work the past several weeks spreading the word throughout the soccer community and footgolf industry in the county. In addition to Escondido, there are other footgolf courses in Carlsbad, Mission Bay, Tecolote Canyon, Sun Valley, Balboa Park and National City. As for the hours at Reidy Creek, Agnew said the footgolf course is open during the same hours and he has seen mixed groupings of traditional golfers and footgolfers. Several months ago the council discussed the city-owned course and how to increase its revenue. Footgolf was an idea mentioned, and now has become a part of the landscape. Agnew said the course had a soft opening in March and since then has seen a steady increase in footgolfer traffic. A nine-hole round of footgolf costs $12.